Democratic U.S. Rep. Beto O'Rourke reported raising almost three times as much money over the first 45 days of 2018 as Republican incumbent U.S. Sen. Ted Cruz. *Editor's note: This story was updated to reflect a statement from the Cruz campaign. DALLAS — U.S. Rep. Beto O'Rourke, an El Paso Democrat, once again reported raising more money than Republican U.S. Sen. Ted Cruz in what is shaping up to be an intense general election matchup. Over the first 45 days of 2018, O'Rourke raised $2.3 million — almost three times more than Cruz's $803,000, according to new reports filed by Cruz and O'Rourke with the Federal Election Commission. 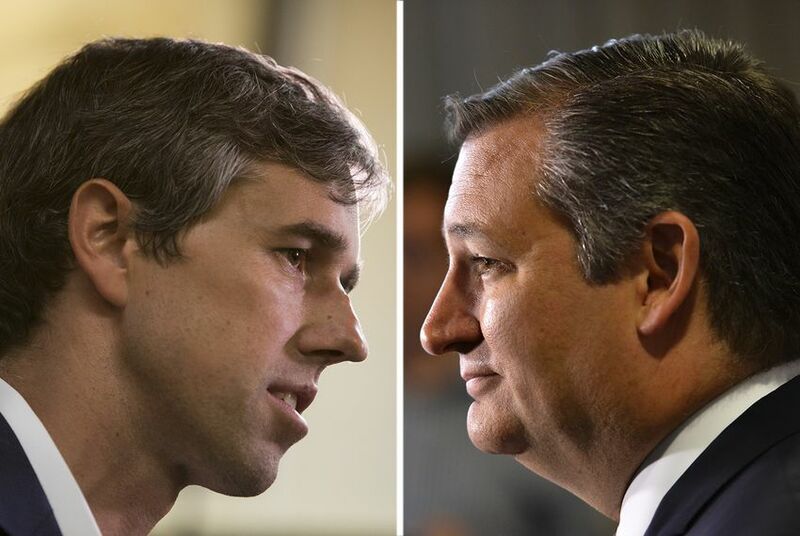 O'Rourke spent $2 million, while Cruz spent $1.2 million, according to the filings. They also show a narrowing cash-on-hand gap: O'Rourke reported having $4.9 million in the bank, compared to Cruz's $6 million. O'Rourke announced the reported numbers to a cheering crowd at a Friday night town hall in Dallas. The Cruz campaign responded to O'Rourke's fundraising advantage for the period by highlighting a trip that U.S. Senate Minority Leader Chuck Schumer, D-N.Y., made to Houston last month to raise money for several Senate candidates, including O'Rourke. "Chuck Schumer did a great job — he came to Texas early in the year and got national liberals really excited about the chance to elect a pro-amnesty, anti-gun, pro-big government liberal to represent Texas," Cruz spokeswoman Catherine Frazier said in a statement. "We don’t believe that's the direction Texans want and are confident this will energize them to ensure they turn out to vote for someone who wants to keep taxes low, keep repealing regulations including Obamacare, and uphold the Texas values that have made and kept our state strong." Twelve days before Election Day, federal candidates are required to submit to the Federal Election Commission campaign finance reports. These records capture fundraising and spending activity between Jan. 1 and Feb. 14. O'Rourke released his fundraising numbers a week ago. While this is a sign of momentum for O'Rourke, it's worth considering that this race, in a state as big and expensive as Texas, could cost into the tens of millions. Moreover, Cruz is likely to have a deep well of super PAC money to help him in the fall, while O'Rourke early on in his campaign pledged to not accept corporate political action committee money. But the margin does indicate that the Democrat is running a viable campaign, is picking up momentum and has strong supporter enthusiasm. Both men are expected to easily win their party primaries on March 6.